Along with the snow comes the ice. While ice can sometimes be beautiful, it can also be dangerous. Ice makes sidewalks become slippery and roads dangerous to drive on. During these cold days, the snow that melts off of your roof will often freeze, which is what creates icicles. 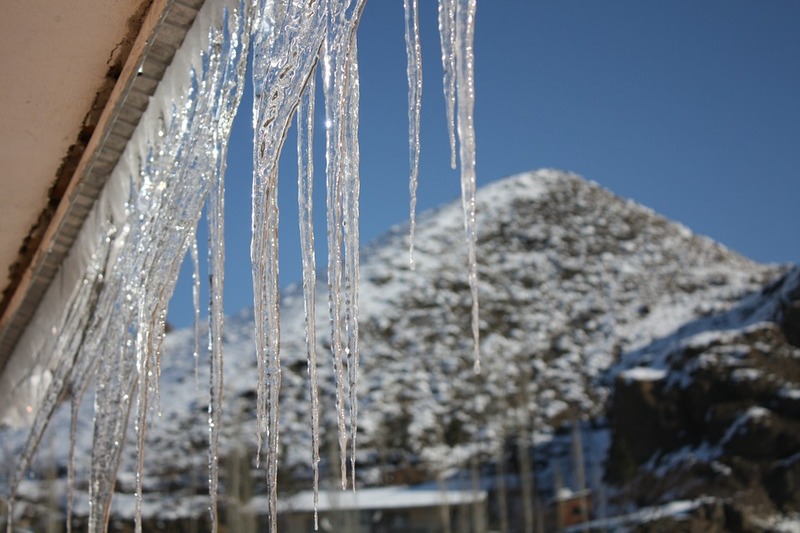 While icicles may be pretty to look at, they can also be dangerous. They can damage your home and can injure you if it happens to fall while you are under them. Removing icicles can be just as dangerous, which is why you must take extreme caution when removing them. Today, I'm going to go over effective ways to remove icicles from your roof. 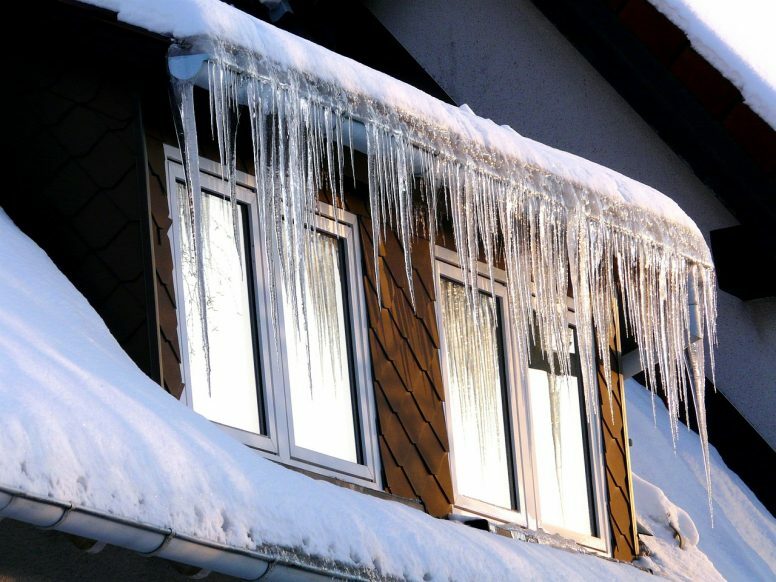 I hope this article helps you remove the icicles on your roof safely. Using a hammer to remove the icicles on your roof is the most effective way. However, it can also damage your roof. That is why you must pick the correct hammer before you get started. An ice pick may be a safe option, as it doesn't damage your shingles. A rubber mallet is another safe option. 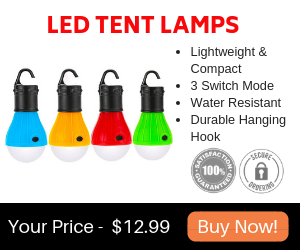 It doesn't remove the icicles as efficiently, but it doesn't damage your roof. Remember that your own safety is just as important though. You'll want to be on a ladder when removing the icicles because then you don't have to worry about an icicle hitting your head. Make sure that you put your ladder on sturdy ground that doesn't have ice on it. Gently hit each icicle until all of them have been removed. Warm water is another effective method for removing icicles from your roof. It does not damage your roof and it is overall a safe method. Keep in mind that it may not be as effective if you are removing thick icicles. However, if you work on one problem area at a time, the icicles should melt. To do this method, fill a spray bottle with warm water and begin spraying it onto the icicles. Try focusing on the ice that is clinging onto your roof. That way, the entire icicle will fall off the roof. A chemical deicer can be very effective at remove icicles from your roof. However, it can also discolor your roof and can damage any plants that you have. Calcium chloride-based products are usually safer than other chemical deicers. That said, you'll still want to cover your plants and carefully follow the instructions on the label. Avoid sodium chloride-based products or rock salt as these options will damage your roof. If the icicles are less than a foot long and an inch wide, you can use a telescoping roof rake to remove the icicles from your roof. Wear safety goggles and gloves, extend the rake from a distance, and gently push the base of the icicles to free them. Be careful when removing the icicles, as you don't want one to fall on you. Make sure you are standing at least a yard or two away from the roof. Ice-melting tablets are similar to spraying warm water onto your roof, except that it saves you from the labor. The tablets help prevent roof damage by melting through the icicles and allowing water to drain safely. 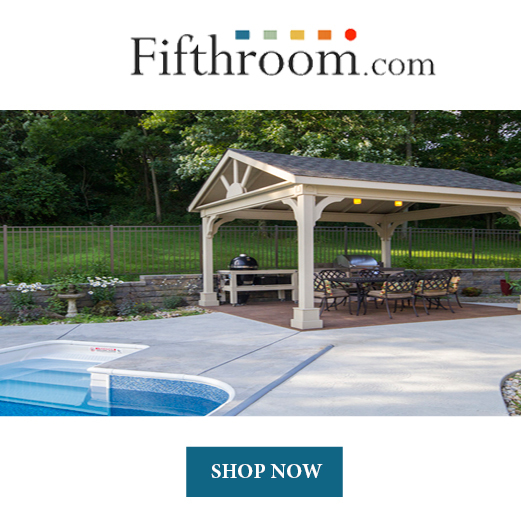 You don't even have to climb onto your roof to use these tablets. This method is considered the safest method for remove icicles from your roof. If your gutters stay warm, icicles cannot form on them. That is why it may be a good idea to apply heat tape onto your gutters. This method for icicle removal is ideal for climates that get really cold temperatures. You can use this method for preventing icicles, as well as a way to remove them. A lot of times, the reason why icicles form is that the gutters are clogged with leaves and other debris. Remove any debris in your gutters before freezing temperatures arrive. To remove the debris, stand on a ladder and use a scoop to remove the debris from the gutters. Wear safety goggles and gloves. 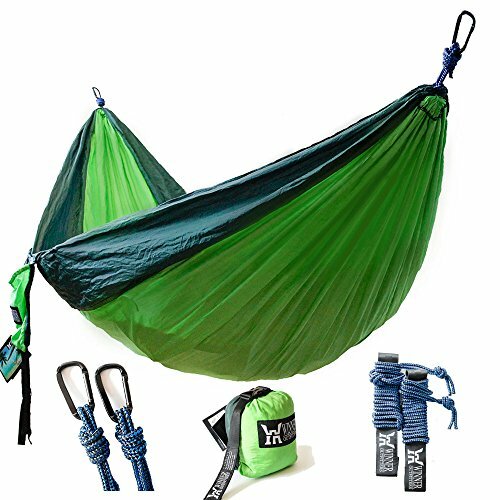 Place the debris on a tarp instead of on your grass. Too much debris on your lawn can cause the grass to become unhealthy. Once you are finished, you may want to flush your gutters by spraying a hose onto them. However, you don't want the water to freeze and cause more icicles. Only flush the gutters if the temperature is warm out. The reason why icicles form is that the snow on your roof melts when the temperatures warm up. But when the temperature cools down again, the melting snow freezes, and hence forming icicles. To prevent icicles from forming, try removing the snow before it has a chance to melt. To do this, use a roof rake to scrap the snow off of your roof. After all the snow is off your roof, you can shovel it away from your house. The most common reason why icicles form on roofs is that the attics are not usually insulated properly. If your roof warms to above 32 degrees F, the snow begins to melt, but the air is cold enough to freeze it again by the time it reaches the edge of your roof. In most homes, heat escapes through ceilings into the attic and warms the wood and shingles directly above it. Make sure that you close up attic bypasses and add roof and soffit vents. 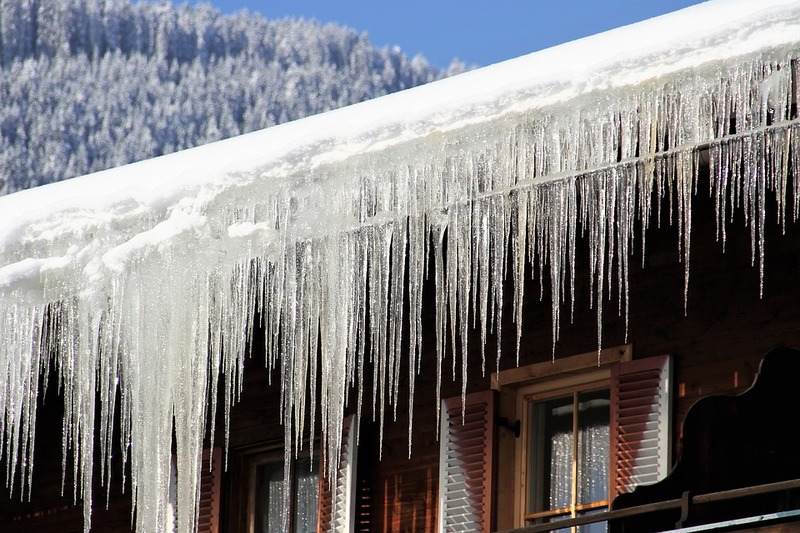 Removing icicles from your roof can be a dangerous task. That is why you must be extremely careful. 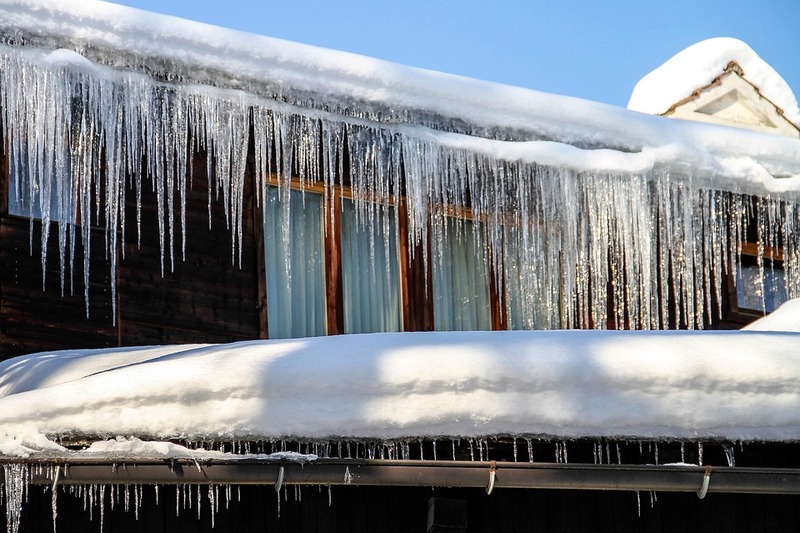 Here are some tips for staying safe as you remove the icicles from your roof. Make sure you wear the proper clothing for removing icicles. Safety goggles and gloves prevent the icicles from hurting you if they touch you. If you'll be stepping onto a ladder, avoid wearing clothes that could cause you to trip. Make sure you dress warmly if you plan on staying outside for a long time. Never stand directly underneath icicles, whether you are removing them or not. 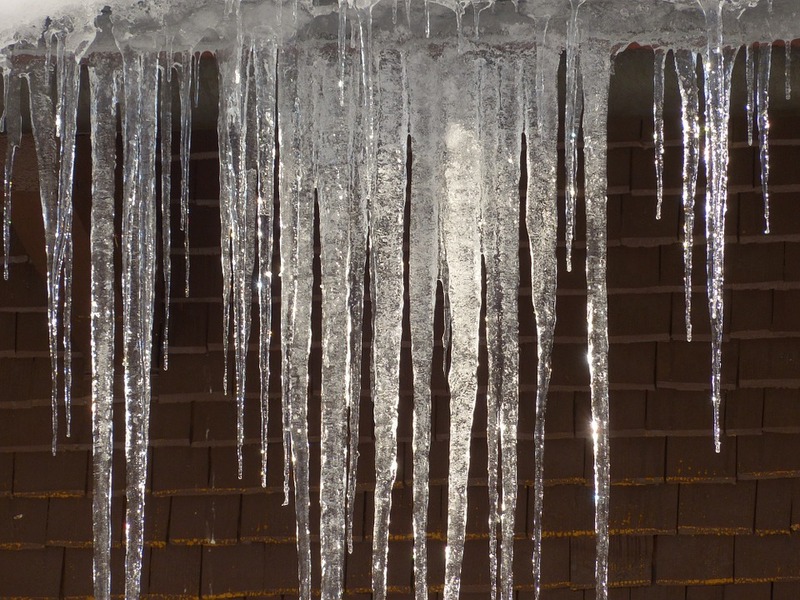 Icicles can cause serious injuries if they fall on top of you. Always stand back at least a couple of yards away from the icicles. So many people each year fall off their roofs as they try to remove icicles and snow from their roofs. Roofs are often slippery during the winter because of all the snow and ice on them. If you must go on the roof, be very careful and don't try to stand up on the roof. Buying a sturdy ladder is something that you will never regret. Sturdy ladders save you from so many injuries. Make sure you purchase a ladder that has the correct weight limit that will fit your needs. Always read the instructions before setting up your new ladder. Don't set up your ladder on ground that is uneven or icy. When you are done using your ladder, keep it out of the weather. If removing icicles from your roof seems too hard, don't hesitate to call a professional. Professionals will know exactly what to do and will not damage your roof. Staying safe is always the most important thing, so call a professional if you feel that the job is too dangerous for you. Removing icicles can be a difficult task to do. It can also be dangerous. However, it is necessary to remove them because if you don't they can hurt you, as well as damage your roof and gutters. With the proper tools, you can easily remove icicles from your roof. Today, I went over the best methods for removing icicles. The first and most popular method is to use a hammer. Because a regular hammer can damage your roof, it is best to use a rubber mallet or an ice pick. The next method is to spray warm water on the icicles. This is a safe and easy method for removing icicles from your roof. Ice-melting tablets are also a good choice, as they melt the icicles without you having to do much work. Other methods for removing icicles include using chemical deicers, a snow rake, and heat tape. There are also several tips for preventing icicles from forming. Because icicles form when the snow melts off your roof, you'll want to try to keep your roof cold. To do this, make sure your attic is properly insulated, as this is the number one reason why icicles form. Also, try removing debris from your gutters and remove any snow on your roof. This will prevent icicles from forming, which saves you time from having to go out to remove icicles. When you do remove icicles, make sure you are careful and stay safe. I hope this article has helped you understand more about how to remove the icicles on your roof. Stay safe!